City Dog, Country Dog: Where Do Small Dogs Thrive? Anyone who's heard the catchy theme song to the '60s television show "Green Acres" knows what a conundrum it can be when a couple has differing opinions about where to live. But what if it's your dog with the attachment to a "penthouse view"? Or would your pooch tell you to "keep Manhattan, just give me that countryside"? Are petite pups better suited for city streets or green acres? Life in the city isn't always easy for a four-legged friend. 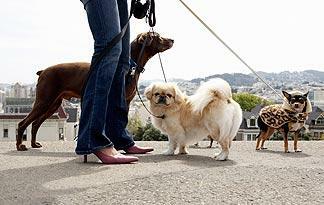 The hard sidewalks can hurt sensitive paws, and a height-challenged dog may get stepped on or tangled up on a busy street. Urbanites also have to contend with small living spaces, a lack of private yards and city pet ordinances. But many small dogs prosper in such a fast-paced environment. Your little city slicker can have the world at her paws with dog parks, spas, hotels and even restaurants that cater specifically to the furred set. If you're concerned about walking your dog on the hectic streets, consider purchasing a dog stroller -- they keep little dogs safe and contained while providing fresh air during a nice stroll -- or a pair of dog booties to protect her paw pads from injury while she's taking care of business. According to the American Kennel Club, most small breeds adapt well to apartment living as long as their owners give them plenty of attention and playtime. Breeds like the pug or Chihuahua make excellent roomies -- they require little space and minimal exercise, but are big on companionship. It's probably a given that all dogs love the freedom of wide-open spaces, but some small dogs will have a better appreciation for the great outdoors than others. Natural herders like the Pembroke Welsh corgi or Shetland sheepdog will be in nirvana with lots of land to explore, but according to the American Society for the Prevention of Cruelty to Animals, many of the toy breeds -- especially those under 20 lbs (9 kg) -- might find the grand scale of it overwhelming. Don't forget that a country dog doesn't necessarily mean an outside dog, especially with small canines that might appear tempting to a wild animal looking for a meal. So make sure you always know her whereabouts and that she's safe indoors before nightfall. Other predators are tiny -- it's a good idea to regularly check your dog for parasites, like ticks, that are found in wooded areas. Train your dog to come when called and consider having her microchipped in case she ever roams too far -- which is good advice for a city-dog owner, too. Really, so long as your little one has a warm, loving place to settle into, the location isn't all that important. Whether you live in SoHo or have your own Green Acres, daily exercise, a healthy diet and lots of affection are the perfect formula for any small dog to thrive.